Long legs come in handy for this little gal. 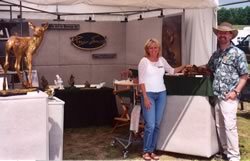 View all bronze wildlife sculptures by Roger Smith. Watchful Doe is among nine outdoor sculptures selected for this year’s Walkabout Sculpture Show in Boyne City, MI. JTV Studios recently visited my studio and foundry to interview me for an Art Beat segment on the Bart Hawly Show. My "Moose" sculpture recently won the Kentucky Wildlife Award that is given to the exhibits best work at the Kentucky National Wildlife Art Exhibit . » View the archive of announcements. My wife, Vicki, and I (pictured above) travel the country attending art shows. I thoroughly enjoy meeting people at the shows, and I hope if there's a show in your area, you'll take the time to introduce yourself and and chat about our mutual appreciation of wildlife art. Our calendar lists upcoming events we'll be attending.